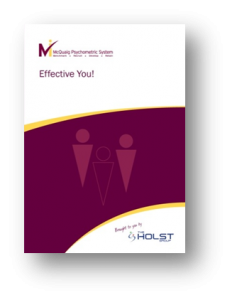 Learn more about your strengths with McQuaig Effective You! Who should attend Effective You! course? Effective You! is a half-day course that will help you build on the powerful self-knowledge gained by completing The McQuaig Self-Development Survey™. Are you making the most of your talents at work? What simple steps can you take to deal effectively with the things that might be holding you back? If you’d like to learn these and more, attend Effective You! Gain insight into your personal strengths and developmental areas. Apply your understanding of your individual behavioural traits to practical, on-the-job situations. Identify several key actions you can take back to work and start on immediately. Ensure that your action plan is aligned to your organisation’s goals. Develop skills to help you seek the coaching and support needed from your boss. A detailed analysis of strengths and developmental areas. Up to forty action items to help you maximise your professional effectiveness. A simple methodology for prioritising your action items and aligning them to your company’s goals. A personal self-development action plan. A fun, interactive course with lots to learn about You! You will leave with a detailed action plan to encourage improved job performance, increase job satisfaction and greater success. We offer a full range of technical and development courses including Level 1 McQuaig Certificate, Effective Teams and Effective Interviews and Selection.